Got one of these for my birthday this year, just tried it out. For the money, I’d have to say it is a great value. A little play in the handle, but not any more than I’d expect for the price. Harbor Freight has them right now for just under $40. If you’re into tight tolerances, this isn’t the tool for you. But if you’re like me and don’t need exact tolerances, this is a really good buy, in my opinion. I have one of these for years now. Never used it. Turns out my saw doesn’t get used enough to dull a chain, but I am getting close. Good to know it works!! Thanks! grizzman, i have used this. I wasn’t thrilled with the results. The chain was sharper that it was before it came off bar, but not even as close to as sharp as I can get it by hand with some files. Sharpening chainsaw blades by hand is REALLY easy and can be done in the field. Once you do it you’ll wonder why you ever paid someone. grizzman, yes, I’ve used it and my results have been satisfactory. Like I said in the review, if tolerances are what you are going for this probably isn’t the tool you want. Northern Tool also offers a wider range of sharpeners with a wider range of prices, too. For me, this one works okay. I’m not really too good at sharpening by hand, although I’ve done it in the field when necessary. Now that I’m not into the forestry neaerly as much and am only chainsawing when absolutely necessary, this tool works well enough for me. Never was too satisfied with taking a chain in to have them sharpened “professionally” cuz when they come back there usually isn’t too much left of the cutter (and I have tried way more than just one pro at this – they’re all the same), and I was going through chains like there was no tomorrow. Tried sharpening by hand in the field for awhile, got to where I could do a “decent” job of it, but I personally like to use the machine too. I bought one last year and have used it. It does a fairly good job on both my chainsaws. I don’t sharpen in the field, instead I have a couple chains for each saw. You can put an edge on the chain in short order. I don’ t get as picky about razor sharp edges on chainsaws as I do with chisels and planes. All this really does is touch up the edge in a quick and consistant manner. I haven’t used my file for a while. A heavy user may want a better quality machine it is what it is. Was worth the price in my opinion. I bought one two years ago and have used it quite a bit and I am pretty happy with the results. I used to work in a shop that sharpened chainsaws so I am very comfortable with the ins and outs of the process. My only complaint is with the chain-stop (it’s somewhat sloppy, and doesn’t work exceptionally well in both directions) but plan to make some small modifications to correct that eventually. In my humble opinion, it’s a great way to get several chains ready to go, so you always have a sharp one available. Enoelf, you’re welcome. When you get to a point of making those modifications, would you consider letting us know what you did? I agree the stop is a little sloppy. If there’s a way to fix that, I’d really be interested in knowing what it is. Thanks. I have one ( the older model) and it works fine for the price. The new model can be found for $29.99 on sale quite frequently. At this price this is a steal. Grizzman, I wanted to let you know I just finished ripping a cottonwood log with a newly sharpened chain that I did on this contraption. Crosscutting also went well last week. 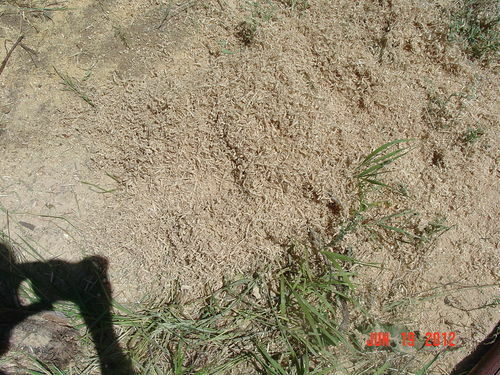 Here’s a couple of photos of the sawdust. 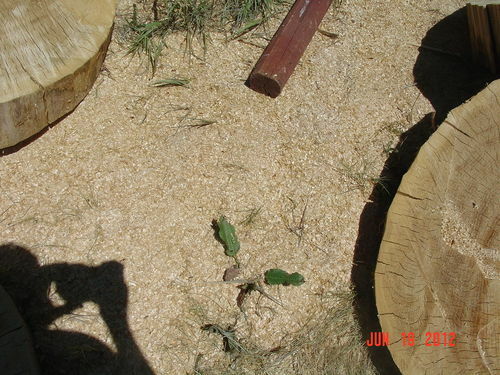 Depending on the direction of cut ripping, you can get shavings (going lengthwise) or more of a sawdust (top to bottom with log standing on end). Again, for the professional chainsawer, this probably isn’t the best tool in the shop. For guys like me, this works very well. Hope this helps you make your decision. i really appreciate the pictures and advice on this, i will probably get one, i dont use my saw a lot, but enough to warrant having this to keep my chains ready and sharp enough to give me good cutting action…so as you stated, if there are modifications made to this machine that will add to its stability, i too would like to know of them..thanks everyone…especially you TZH for posting this in the first place, i just happen to be using my saw the last few weeks, i also bought a new chain..and learned a little about when you buy a new saw, there sold with what is called a safety chain, i have a friend who let me use his new husqvarna and i got the chain resharpened, and it cut good for maybe a 1/2 hour. and this was out in the field, i was sorely upset , as i had a lot of cutting to do, so i went to a place to get it sharpened again…where i learned about the chain they sell with there new saws, so i bought a meat eating cutting son of a gun chain, now that brought a smile to my face…cut like going through butter..and still going…so im hoping the new machine will still make me happy enough so i can get the cutting done i need…i looks so…so thank you . I want one, will they work on a Lancelot carving tool? I have a Oregon 12 volt for field use so now the front of my truck gets used as a work station with the hood up and some ply for saws ect. studie, I have no idea whether they’ll work with a Lancelot. The owner’s manual doesn’t say anything at all. Might want to check with Lancelot to see what they say.